The Professional Surge Protector CSP300WUR1 safeguards common home and office devices, such as computers and electronics, by absorbing spikes in energy caused by storms and electrical power surges. Designed for convenience, the portable CSP300WUR1 is ideal for travelers. 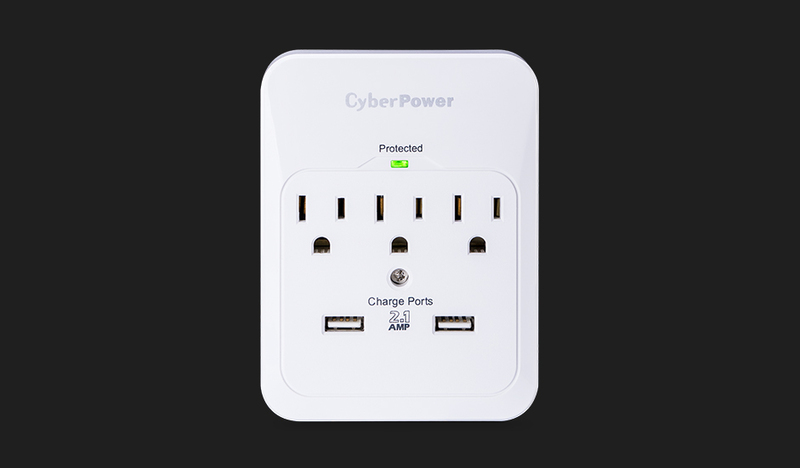 It provides 600 joules of protection, has three surge-protected outlets, and a wall tap plug. Two USB ports (2.1 Amp shared) charge personal electronics, including smartphones, digital cameras, MP3 players, and other devices.The CSP300WUR1 also features metal oxide varistor (MOV) technology, an EMI/RFI noise filter, a status indicator, and impact-resistant casing. This product comes with a with a $50,000 connected equipment guarantee. See user manual for details. A limited lifetime warranty is available to cover defects in materials and workmanship under normal use and conditions.